It’s been more than 1,000 years since the last time Mount Paektu erupted – but that last eruption was one of the largest in recorded history. That 9,000-foot volcano, which straddles the border between North Korea and China, has been waking up. And that volcano is responsible for bringing the North Korea and the Western world together for a surprising scientific collaboration. 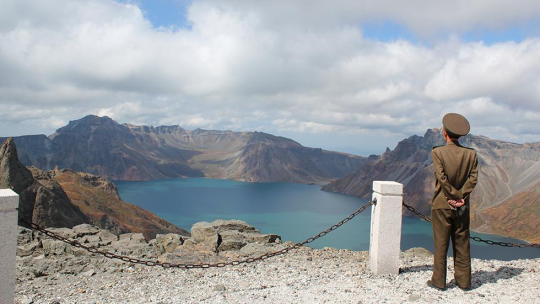 Mount Paektu’s infamous “Millennium eruption” occurred around 946 A.D., the Washington Post reports, and its destruction was legendary. “It’s hard really to imagine the scale, but you’re talking about something like 1,000,000 nuclear weapons all going off at the same time in terms of the energy involved,” British scientist Clive Oppenheimer told CBS News in 2014. The fear that this could happen again is what has North Korean officials in the midst of an unprecedented call for assistance. The volcano rumbled conspicuously in the early-to-mid 2000s. Oppenheimer and another British scientist, John Hammond, were the two volcanologists chosen to study Mount Paektu alongside local scientists in 2011. They’ve been studying the volcano for several years, and their first round of research has finally been published in the journal Science Advances. It’s the first study that has ever looked into the Earth’s crust beneath North Korea.